1. Preheat oven to 200˚C, gas mark 6. Place the Parma ham on a grill and bake in the preheated oven for 10 minutes until crispy then remove from the oven and set aside. 2. Heat the olive oil with the butter in a frying pan, add the garlic clove and breadcrumbs and fry until golden and crisp (about 2–3 minutes). Season then set aside with the crispy Parma. 3. To make the dressing: smash the anchovies with the garlic in a pestle and mortar then tip into a small bowl food processor. Add the mayonnaise, soured cream, 50ml cold water, parsley, tarragon and lemon juice. Blitz until smooth and green, stir in half the chopped chives and season with cracked black pepper. 4. 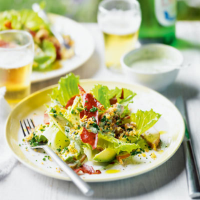 Tear the lettuce and arrange on 2 plates with the avocado, crispy Parma and sliced chicken. 5. Drizzle generously with the dressing, scatter over the crunchy crumbs and remaining chives then serve.